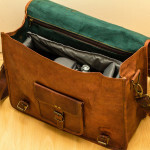 Wellcultured » Messenger Bag or Briefcase? Generally speaking, the messenger bag has overcome the status of “man purse” and become a legitimate bag for men to use. However, just how acceptable is the messenger bag? Can it replace the briefcase? Which one should you choose for your job? That answer depends on the following factors. The most influential factor behind what you should use is the career that you have. For business, the briefcase is still the standard. A messenger bag can be a risky choice, especially for professionals that need to inspire confidence in their clients and establish solemnity, like lawyers. Shoulder straps can also ruin the crispness and look of your suit. Your workplace may also have a rule regarding what you are and aren’t allowed to use to ensure consistency and sameness among employees. Some corporations, although professional, want to create a particular reputation or appearance that is more young, hip, creative, or just plain practical. Other businesses are more casual or have no need for briefcases. A messenger bag is more appropriate for these settings. Consider the culture of your specific workplace, regardless of the industry, as you make your choice. The culture of your geographical location may play a part as well. Texans may use something different than New Yorkers, even if they are in the same profession. If there is no standard for your job, then review your needs. What is the purpose for your bag or case? What will it hold and how much? Where will it go and who will see it? How long will you have to carry it around? Answering these questions will help you decide not only whether to get a messenger bag or briefcase, but also its size, material, shape, color, accessories, and other specifications. Rely on your own preferences as to which type is more comfortable, easier to use, and better looking. Maybe you’ve come to the realization that a briefcase is what you need and you’re disappointed you can’t join in on the latest trend. Don’t worry—briefcases have evolved much since your father’s time. Although the hard-sided box style with a simple handle has regained popularity thanks to Mad Men and the return of retro fashions, it’s not your only choice. In fact, many modern briefcases share similarities with messenger bags, having adjustable shoulder straps, soft sides, more pockets for electronic devices and accessories, and other desirable amenities. The important thing is to get something that fits your circumstances and personality and that will last you a long time, no matter what it’s called.